Specifically designed with a clean face front that sits almost flush. 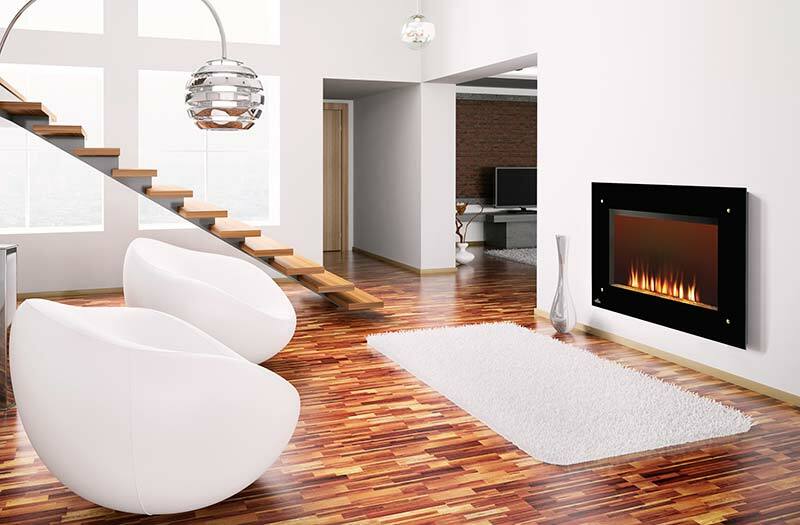 The Napoleon EF39S Electric Fireplace is super convenient. You just hang it in any room, plug it in and it’s ready to use. The EF39S comes with a convenient remote. And it has seven levels of flame height and intensity. So you can create the perfect ambiance in your space. The modern glass front with black frame settles nicely into both traditional and modern décor. The EF39S is lit by long lasting halogen bulbs, giving you over 3,000 hours of brilliant flame. Customize your EF39S to further match your décor, choose from blue, amber, black, red and clear glass. The EF39S Electric Fireplace is the clear choice when it comes to versatility and compatibility. There are two different models under the EF39 name. The HD, heated model, which hangs beautifully on the wall. It can heat a room up to 400 square feet, allowing you to turn the furnace down and save a little money. And the EF39S which does not come with a heater, but recesses fully into the wall. This model is great for electronics that cannot be near heat. It’s also fantastic for families with young children who still want the elegance of an unobtrusive fireplace. However no little fingers will get burnt with either fireplace. A modern work of art, the EF39S is an instant transformation for every room. Condo, house, apartment or spa, the EF39S brightens any space. It’s glittering topaz glass ember bed sparkles with warmth and elegance. Imagine changing a space by just hanging this fireplace and plugging it in. Every EF39HD ships with the convenient remote, wall mounting bracket, topaz CRYSTALINE™ glass ember bed, and manual.